Eggs and spinach for breakfast, anyone? Or lunch or dinner, for that matter. If you’ve never tried this spinach and eggs recipe, we’re sure you’re going to be converts once you do make it. We go through spells where it’s on our menu more than once a week. And that’s no bad thing because this dish is also really healthy! Definitely one of our favourite egg recipes. We arrived to live in Turkey as non-spinach-lovers. Well, in the UK, we had bought the odd bag of baby spinach leaves from the supermarkets just because we knew spinach is exceptionally good for you. And because it was the ‘New Cool’ to have baby spinach leaves in your salads. Neither of us were experts on its flavour and we certainly certainly never experimented with other spinach recipes outside the world of salads. Spend any amount of time in Turkey, however, and it’s impossible to escape the fact that spinach is a significant feature of Turkish cuisine. At the moment, Fethiye market is packed with the stuff. Huge piles of dark earthy green muddy leaves, still attached to their roots. You don’t buy a (very expensive) sealed cellophane bag of washed, delicate, baby spinach leaves. You buy kilos of unwashed greenery, rammed into a bag – as much as will fit in – and it’ll only set you back a few lira, depending on the time of year. So, what to do with all this spinach? We hate walking around Fethiye market and ignoring foods that are obviously in season. 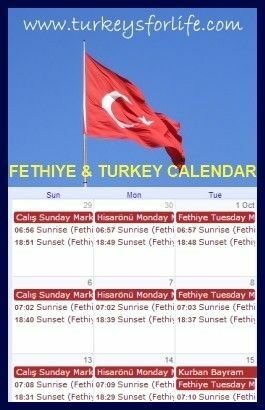 We started to look into more Turkish recipes as soon as we arrived in Fethiye just so we could make use of the seasonal produce – and maybe learn to love the vegetables we always avoided back in England. 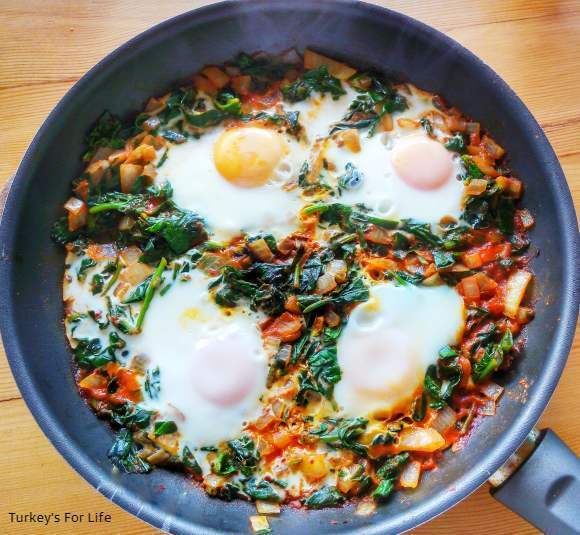 Spinach definitely fits into the category of one of those greens we have learned to love – and experimenting with Turkish recipes is completely responsible for that. We love to make spinach and cheese börek and also a çintar mushroom and spinach börek. 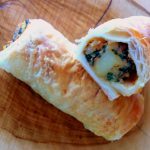 And, staying with the pastry theme, our Turkish spinach and potato puff pastry rolls always go down a treat with friends. But spinach and eggs all cooked together in the one pan – with a couple of added extras, too. This is dream food. Ispanaklı Yumurta – to give it ts Turkish name – is a favourite for so many people in Turkey. And, as soon as we had our first serving of it, all those years ago, we could see why! The amounts in our spinach and eggs recipe are meant as a guide only. Sometimes, we have oodles of spinach. Others, not quite so much. We also use free range village eggs. This dish is a celebration of the spinach and eggs combo – only the best quality ingredients will do. Extra ingredients include sauteed onion and salça (tomato paste). These are completely optional but they really boost the flavours of the dish, we think. As you can see in the photo above, you will often end up with a kind of egg and spinach omelette as the whites of your eggs spread around the pan, fusing the ingredients together. This healthy spinach and eggs recipe is delicious, quick and easy to make. Eat eggs and spinach for breakfast, lunch or dinner. It's up to you. Gently heat your olive oil in a large frying pan. Add your onions and saute until they start to sweat and soften slightly. Now add your spinach. Don't worry if it's all piled up in the pan. It will wilt quickly. As your spinach wilts, stir it around to mix with your onions. Now add your salça and mix it in thoroughly before adding around 200 mls of water. Add your paprika, chilli and salt and pepper. Stir everything in and simmer for a couple of minutes over a low heat. Now make 4 wells in your mixture and crack your eggs into the wells. Allow the egg whites to spread around the pan. Cover the pan and leave to simmer for 4-5 minutes until your egg whites have set. Serve your spinach and eggs immediately either on its own or with toast and natural yoghurt. The calories in this spinach and eggs recipe are meant as a rough guide only - they will differ depending on your choice of ingredients. If you want to, you can make spinach and eggs with two eggs rather than four. We serve our spinach and eggs on top of hot toast. It is also extra tasty with natural yoghurt on the side. If you want to, you can just serve your spinach and eggs on a plate as it is. Just run your spatula down the centre of your pan and divide the mix into two. We love to serve our spinach and eggs on top of a slice of hot toast, however. It makes for a more wholesome meal, especially if we are eating it later in the day. If you’re not particularly hungry, of course, there is no set of rules that says you must have two eggs. Use more spinach instead and have just the one egg. And, well, we are in Turkey. What do the people of Turkey love as an addition to so many of their meals? A good dose of natural yoghurt, of course. And we can tell you that when it comes to spinach and eggs, natural yoghurt is the perfect accompaniment. This is one of my favorite dishes, you can also cook this in the oven if you could be bothered. I usually add biber salca in the spinach onion mix. @ Simcha: We were amazed at how good it was. I thought about maybe adding some biber salca (it’s a permanent fixture in our fridge) so I’ll definitely try that next time. Thanks. You are just like me. 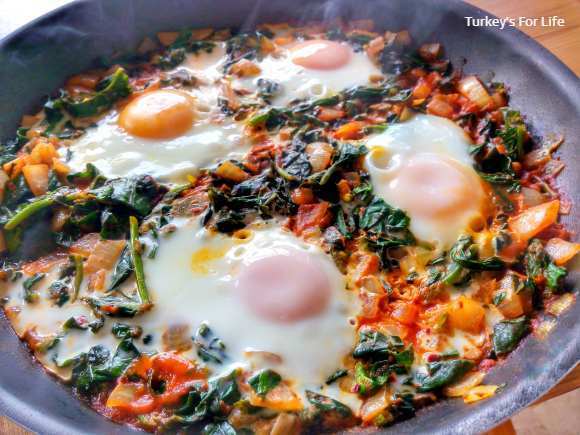 I never used to eat Spinach in the Uk but come to Turkey and was tempted one day to try this recipe. I managed to make it and it is quite delicious. Who would of though Spinach and eggs are a good mix? Never put the onions in mine but will try it next time. @ Anonymous: Thanks for your comment. It certainly was delicious; especially with the yoghurt. Also, one of my favorite simple Turkish dishes that my mother would make for us on a regular basis. We Americanized it by putting on an extra helping of yogurt on top and dousing it with Tabasco (hot sauce). I LOVE spinach- I am totally having this for breakfast tomorrow!! I was a bit put off at first- it’s a student thing to mix spinach in with scrambled eggs (which I’m quite sick of) but this might turn me around!! Ispanakli yumurta is one of my favorite dishes in our cuisine. I make it often in Winter. I can eat it even at breakfast spreading on a slice of bread or lavash. And I love your accompanying it with strained yogurt. @thebockster: You’re going to have to let us know how you went on with this one. We’re curious! 🙂 Can totally appreciate the student thing! Very tasty spinach dish, Julia. A complete meal. I guess it would work baked as well. @ Nisrine: Absolutely lovely. Someone else suggested it worked if baked, too. Many Turkish dishes are cooked on the hob but sometimes we put things in the oven, too. lovely! In Israel we would call this a spinach shakshuka, a variation of the regular tomato kind. Keep the recipes coming! Finally got round to having this for my breakfast this morning. Excellent!! I knew that I would love this as soon as I saw the recipe, as I have always loved spinach. So good I am going to have it again tomorrow, to use up the rest of the ingrediants!! @ MBS01: I think it’s one of those dishes that tastes a lot better than it looks. We loved it too, when we had it. Glad you liked it. Afiyet olsun. @ Anil: Awww. 🙂 We never expected it to taste so good. And do you ‘whip some up’ on a regular basis? It’s gonna be a new regular for us. Oh yes, it’s a regular part of my diet – breakfast or dinner! The Lebanese in Adelaide do this sort of thing with spinach (minus eggs) and put it into a folded “Lebanese pizza”. I love them and decided to make some at home: two onions, big bunch of huge spinach, salt & pepper. Then I made hollows and put eggs in it! and we scoffed it for breakfast. I thought I had invented eggs with spinach! Have you tried cheese melted with this dish. I have eaten a very tasty Cheese, Egg and Spinach Pie it is a wonderful combination. Love the Fethiye market! And believe it or not, I was just looking for more interesting things to do with spinach because it is in season again here in France as well. And voilà, your recipe! Will try and of course the others as well that you linked to. We spent only a short time in Turkey, but loved the food!